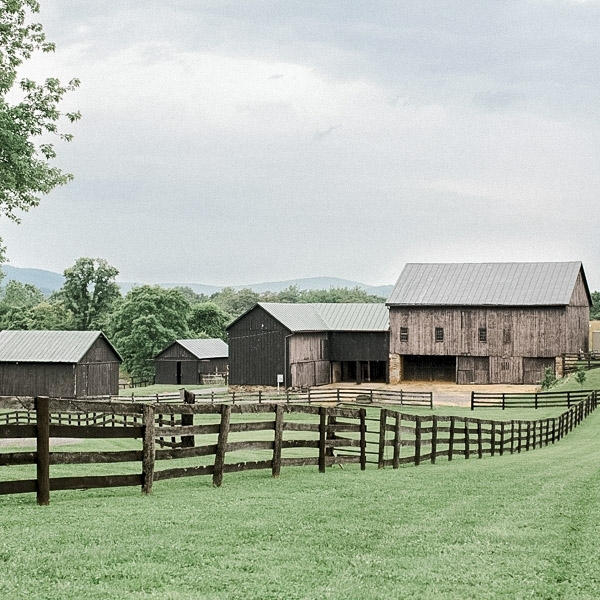 Silverbrook Farm is a charming 1700's farm, nestled among the foothills of the Blue Ridge Mountains of Virginia. As you can imagine, the original structure to the house is as charming as the era it came from. Originally built in 1765, it is comprised of stone and wooden frame additions. The home exudes a welcoming environment to all who enter. Several additions were made to the home throughout the years, expanding to its current use as a working Bed & Breakfast. The home itself has only had two owners through the years, the Potts family and the Florances. As the childhood home of its current owner, Dot Florance Shetterly, the history of the house is evident from the paintings on the walls, to the elegant and timeless decor. In addition to the beautiful farm house, there are several outbuildings, an english boxwood garden, an elegant barn, a treehouse, a woodland ceremony site, and a tent site adjacent to the barn. All of this on 37 picturesque acres in the heart of Loudoun County, Virginia offers the perfect location for your wedding. The home itself serves as a B&B for the bride & groom and additional wedding guests. The bride and groom receive a complimentary night at the B&B and are treated the next morning to a proper country breakfast. Reminiscent of a scene from Pride & Prejudice, the English boxwood garden is the perfect place to hold a small ceremony. It can also be used for a small rehearsal dinner and has even been utilized as an outdoor reception and cocktail hour space. Of course, formal photos taken here are also delightful! The rustic barn, with its understated elegance, is the perfect place for your guests to enjoy a meal, kick up their dancing shoes, and meander at the bar. This one of a kind barn boasts two levels, with its upper level overlooking the dance floor. Not to be missed are the gorgeous crystal chandeliers, the twinkle lights, and the lounge areas placed all throughout the barn. The most difficult part of the wedding day becomes guests not wanting to leave this space! If you are looking for that one of a kind woodland ceremony location, look no further! We know that a woodland setting is hard to come by in this area. We have custom designed a woodland arch that is ready to be decorated to your hearts content. Guests may even witness a passing deer or two drinking from the nearby stream. What could be better than sneaking off with your love, for a few moments alone in your own private treehouse? This treehouse is located near the Woodland and is the perfect retreat for your first few moments as a married couple. The most popular location to exchange vows at Silverbrook is at the arbor in the garden. Views of the farmland below and the Blue Ridge Mountains in the distance create a calming and peaceful setting. The arch is naturally decorated with vines, but couples can add their own florals and decor to make it their own. The raised platform under the arch provides the perfect view for your guests and they won't miss a thing as you say your "I Do's"
The front porch is not just the perfect spot to enjoy a glass of wine and rock in the rocking chairs, it can also be used to host an intimate wedding dinner or rehearsal dinner. Tents and other temporary structures are placed near the barn on land that has been graded to accommodate the largest of tents. This works particularly well for large weddings that also want to use the barn for the night time festivities. This small historic chapel on the property is perfect for more intimate ceremonies rain or shine. You will fall in love with the stained glass details, antique candelabras, and the hand hewn benches that serve as pews. This one of a kind chapel is sure to wow your guest and create a truly memorable ceremony experience. This is a wonderful option for those interested in a pop up wedding, or simply for photos!